For the most demanding areas, Safetred Universal Plus provides R11 slip-resistance while Safetred Aqua is the ideal solution for wet room areas. 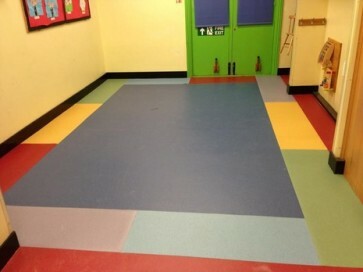 Unique on the market, Safetred Spectrum tiles combine anti-slip properties and the convenience of tiles. Tarkett Safety floorings are a new high performance alternative to traditional safety floors with extra slip-resistance for greater safety. They are an ideal solution for any area that presents a risk of slips or falls in sectors such as retail, leisure, industry and commerce. © Copyright The National Flooring Centre Ltd 2016. All Rights Reserved. All trademarks acknowledged.